Christmas trees, reindeer, snowmen, and more are featured in this latest Puzzlemania(R) activity collection for kids ages 6 and up. 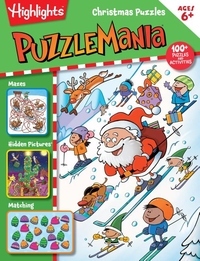 This title is decked out with a wide variety of Highlights(TM) best puzzles and games that will have kids excited to ring in the holidays. This Christmas-themed collection is packed with a wide range of kids' favorite puzzles, including mazes, number puzzles, wordplay, brainteasers, matching, and Highlights' ever-popular Hidden Pictures(R) puzzles. With puzzles themed around Christmas presents, snowflakes, reindeer, elves, and more, this book will be the perfect Christmas gift to keep kids busy during the holidays.